The acoustics of the place of worship allow the sparse instrumentation and vocals to sound pious, even when the lyrics promote the heavy consumption of alcohol and non-marital sexual relations. 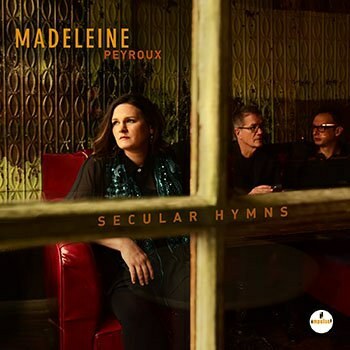 Madeleine Peyroux takes on some of the best of the best music here; not the Great American Songbook, but the underground classics that speak vibrantly about one’s passions and vices. Let me be straight: there are few performances in history as good as Lee Dorsey gurgling Allen Toussaint’s “Everything I Do Gonh Be Funky (From Now On)”, Sister Rosetta Tharpe wailing on “Shout Sister Shout”, or Tom Waits snaking through his Dada poetry on “Tango Till They’re Sore”, not to mention oft-recorded dark treasures like Stephen Foster’s “Hard Times Come Again No More”, the traditional ode to hoboing for the lord, “Trampin’”, and the blues number “If the Sea Was Whiskey” (better known as “If the River was Whiskey”). Lesser singers might feel intimidated by the high quality of the performances that came before, but Peyroux’s renditions come off as inspired. She calls these songs “Secular Hymns”, and this serves as a good name for the ten songs here. Whatever their original intent, Peyroux gives each track a spiritual touch. For example, she leads off with “Got You On My Mind”, a juke joint blues that Big Joe Turner made popular by keeping the music somewhat upbeat in a noir way, as if he’d been drinkin’ the woman who left him off of his mind. The lyrics are sad, but Big Joe found sweetness in the pain. Peyroux sings the words slowly, like a plea or a prayer. The song’s gospel roots show: it would be easy to imagine lyrics about “where are you, god, and why have you forsaken me” sung to the melody. Relatedly, the songs were recorded in a church, the Parish Church of Saint Mary the Virgin in the United Kingdom. It’s just Peyroux singing and playing acoustic guitar, John Herrington on electric guitar and vocals, and Barak Mori on upright bass and vocals. The acoustics of the place of worship allow the sparse instrumentation and vocals to sound pious, even when the lyrics promote the heavy consumption of alcohol and non-marital sexual relations. Peyroux is endowed with a distinctive voice that often takes on the coloration of Billie Holiday and other female jazz artists from an earlier era. This gives the music a retro feel, as if these tracks are from cleaned up and remastered 78s from the past. One can only wish that one was hearing Peyroux sing the material at a smoky, whiskey-soaked night club with the lights down low. Instead, this music will be relegated to cleanly lit coffee shops as background. The record deserves more serious listening. And does Peyroux match or beat Dorsey at being funky? No, it’s not even close. Artists such as Bruce Springsteen, Ike & Tina Turner, Jerry Garcia, and John Lennon have covered Dorsey with similar results. But Peyroux does make a decent attempt and her version holds up well. This holds true for the other songs here. Peyroux offers fine performances, but they are hers and not the originals. This isn’t karaoke. The originals are mostly well-known classics from the past—they aren’t records meant to be broken but to be replayed again for their own merits.